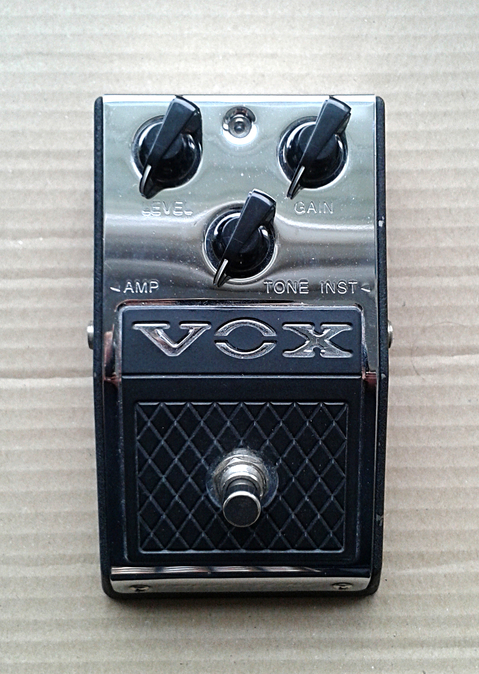 Vox V810 Valve Tone. Made in china, early 00’s. The brand name is sometimes so big and trustworthy that anything released under that brand will become a collector’s item and a classic. Were the title warranted or not. I’m more than certain this is the case with Vox. In the early 00’s, Vox released couple designs in a housing like this. The box is pretty neat looking and visually there is very little negative to say. Strong moulded metal with thin tin plate at the bottom. Reminds me a lot of the bottom plate we find in Cry Babies. Plus the screwed on tin plate at the top too. Visually, the two pedals are a lot like each other. The “Valve-Tone” text is punched to the front of the pedal. These are well built pedals and i’ve had a few units come in for repairs before. The thing that may cause issues is the switch. If the pedal is in heavy use, the mechanical switch is about to give in at one point. This doesn’t mean that the issue is that common or you should worry about it. It just means that all switches are subject to worn. Some can take 15 years of stomping while others give in in a few short years. The circuits are stacked, so the main circuit has its own board and the board mounted pots have their own. 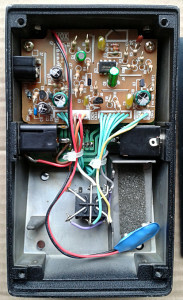 Boards are connected with pin sockets. Higher level of excellence is present than what we see is out usual chinese mass produced masses. Well built. Point i raised in the very first sentence becomes clear once we take a look at the schematic. 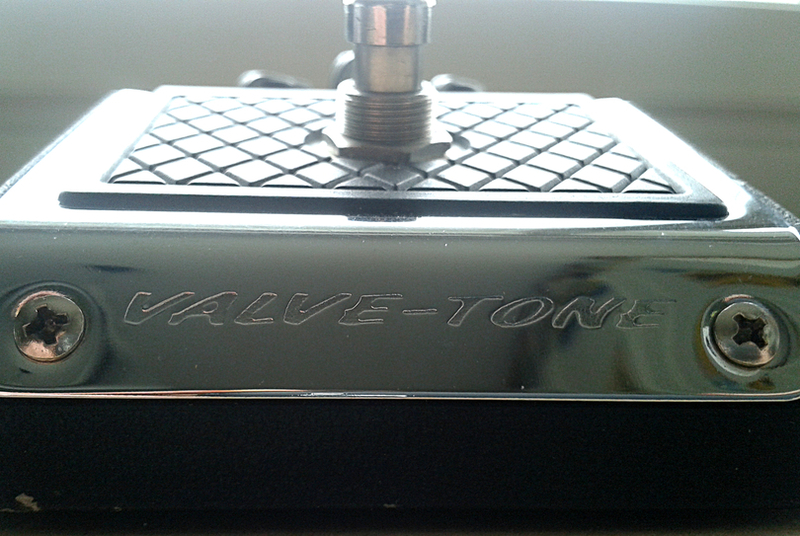 Valve-Tone. In other words, a YATS. For those not that familiar what YATS stands for, i’ll spell it out for you. Yet Another TubeScreamer. No modifications. Just a “millennium bypass” and slightly more stable power section. That’s it. No changes to the signal path (except for the weirdly huge value for the output cap and the missing electronic switching, of course). I’m sorry, but i find it rather difficult to understand the value folks ask for these these days. Sure the box looks cool and there a text “VOX” on it. But come on. Maybe i should have left a sub tag for all the TS pedals i come across. Must be the most copied design in the history of all effects. Exactly like the schematic lets us believe. It’s a mid-honking overdrive with nothing new. Works and sounds pretty with low(ish) output pickups. In other words, still just a tubescreamer. I’m tired of writing tubescreamer with a capital letter. There are just too many of these around. VOX didn’t have one before, so i guess it was about time. Sort of an disappointment, but then again. Why wouldn’t i want to have a VOX tubescreamer in my collection. Just know what it is and do not pay the asking price. It is still nothing more but a tubescreamer. This entry was posted on Sunday, May 3rd, 2015 at 11:06	and is filed under Vox. You can follow any responses to this entry through the RSS 2.0 feed. You can skip to the end and leave a response. Pinging is currently not allowed. I have one of these YATS and even when I barely use it (I prefer my Tubescreamer with the 808 mod) the switch has died. Would you be kind enough to tell me how to put a good ol’ 3pdt in it? There isn’t much point in true bypassing this as there isn’t anything wrong with the current millennium style bypass method. If you have 3PDT stomps and no 2PDT, you could just leave one row free and use the 3PDT as two pole swith. On the other hand, 2PDTs have a tendency of being more reliable the three pole switches. My guess is that these have just a bad batch. Either way. You can go with 3PDT and if you use just two poles of it, there is no further modification needed. Cool, I only have a 3pdt and wasn’t sure how to wire it to replace the 2pdt.